One of the most difficult tasks to execute in an implementation is transferring knowledge to users. Simple as it might seem to be, training and optimum knowledge transfer of a totally new system and operational concept is not that straight forward. So what can trainers and trainees do to reap the utmost benefit out of the training room? This article looks at the hurdles one is likely to face during the training and cut- over stage of an implementation. It also applies to generic oracle training such as Oracle E-business suit boot camps. PC Skills and competency of users: On a number of implementations, more so government oriented implementations here in Africa, where I come from, a number of users will come for Oracle applications training a few weeks after learning how to use a computer for the first time in their lives. This greatly impedes the training progress and delivery of the course. Navigating the Oracle forms requires one to have adequate hands on and up to the minute PC skills. It’s imperative that a thorough Training Needs Analysis be carried out before, to ensure that all the trainees are well equipped with the required skills set to attend Oracle functional training. For a first timer, the terminology of any ERP system is rather difficult and confusing, making the learning curve even much steeper than it ought to be. To overcome this, trainees must be encouraged to go through the glossary of each manual of the module they are attending, before or even as the training commences to help them demystify Oracle Applications . I find these glossaries very useful even in my day to day work. Inadequate prior preparation of trainees before the course is a great hindrance to effective and optimum delivery of training. It’s recommended that they read through the manuals at least before and after attending that module. Bear in mind that the trainer cannot give or explain to them everything that they need to know, so they should take their own initiative. More so it is recommended that they practice and play around with the system during their free time, say on weekends. It helps them discover things on their own and get more comfortable and faster at navigation. Trainees also have a habit of rushing through the labs and exercises without bothering to comprehend what they are doing, and understand the flow of the systems functionality. Usually they’ll just click away at navigation paths, to finish with the exercise and get on with the next topic. This is usually attributed to limited time allocated for the large volumes of course material to cover. It is therefore imperative that they put in extra time on their own, and go over these exercises, slowly referring to the Students guide, and reading over the theory to understand exactly what it is they are clicking and tabbing away at! The different paces at which trainees pick up and learn can prove to be another frustration to the trainer. Some students are very fast and quick learners, whereas some others are slow. The evaluation from the former about the trainer will usually be very good, while from the latter is usually bad and discouraging. For that matter, it’s usually a good idea to sit the good trainees with the slow ones to pick them up when they get lost. This puts less pressure and inconvenience on the trainer having to go around attending to the individual problems of each student. Distractions during training such as trainees reading news papers and magazines, or listening to music can be very frustrating to the trainer. You would be surprised at the number of students playing solitaire while you’re at the front of the class, labouring to explain what accounting flexfield structures are and how they are created. The above are the “Achilles’ heels” of the students or trainees. Now how about the trainers? The greatest complaint I have heard from trainees about all the trainers for all the Oracle courses I have attended is that they are too fast! Trainers are usually flying through the material and usually leave the students more perplexed and confused than they came. It’s not entirely their fault though. The time allocated to covering each module is usually extremely limited, as opposed to the material they have to cover. Take an example of the General Ledger students guide, which has 1306 pages with severely brain-racking stuff, and only 8 days are allocated to it. So usually the trainers are forced to hurry through, so that they can cover as much ground as possible. However in my opinion, I think the optimum strategy is for the trainer to give the students a primer to the most important part of that particular module, ensure that they understand the basics thoroughly and then encourage them to read the rest on their own, off course with the trainer’s guidance. After all, experience shows that they usually come to grips with the stuff, after they are in a real work environment and can only at the most grasp about 40% of what they should know in class. It is also impossible for the trainer to teach everything. One trainer during a boot camp I attended decided to start us off slow, and with time increased his pace, and he pulled it off really well. This could be another approach. The trainer’s inadequacy in explaining the system functionality in relation to the generic accounting processes, and the accounting effect of each process or task carried out by the student on the training instance is another hindrance to effective training delivery. 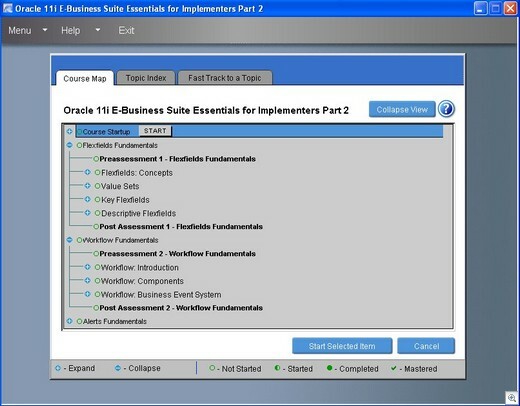 Bear in mind that most attendants of these Oracle courses are accountants and therefore want to understand the accounting logic of the system as well. It is common practice for trainers to ask the students to create an invoice, after which they are asked to validate it and then run the payables accounting process without explaining the double entry effect on the accounts involved in the transaction upon completion of the process. Accountants are fanatical about the debit and credit gospel, so rather than only explaining how the system works, go are step further and explain the accounting concepts. It makes learning a lot easier and fun for them. Whereas I overly harped on the string of inadequate preparation of the student’s, the lack of preparation on the trainer’s side can also prove to be disastrous or usually is for that matter. Trainers are usually experienced functional consultants who already know the generic functionality of many Oracle modules, so most of them think why go through the exercises before hand? The relevance of the trainer going through the exercises before delivering the training however experienced he/she is, is to discover any functionality flaws, due to bugs or wrong set-ups of the training instance, and resolve them, or find work arounds before the class. It often looks very awkward when the trainer is fumbling in front of the students, because something is not working the way it should or a concurrent process is completing with an error and he doesn’t know why. Not only does it look like he/she doesn’t know what they are doing, but it casts a darker shadow on the more pessimistic trainee’s belief in the ability of the system to work later on when it goes live. It’s not all about the Trainer and the Trainees. There are other factors which can hamper a training session and these have to do with the training instance/environment itself. The Oracle system is a web based system or operates on the Three- Tier architecture. If you have a class of 20 or 30 students, they’ll be working on different PC’s but ultimately on the same database at the same time! It’s therefore imperative that you plan the memory resources of the server on which the instance is hosted to avoid any disappointment. Just imagine 30 students creating an invoice and saving at the same time, or running a report at the same time. If you have poor memory resources, then the system will hang in most cases. Another work around is to ask the students to save their work or run concurrent processes in at least groups of 5 at a time, rather than all the 30 at the same time. Takes a bit of time, but at least the ultimate goal is obtained. It is also imperative to watch your concurrent managers. A training environment is different from a production environment due to the fact that many users are all doing the same thing at the same time. A poor network in a training environment is a huge frustration to both the trainer and trainee. It’s very exasperating, when a student has laboured to get so far in performing a transaction on the system, then he or she gets an error that they have “lost the connection with the server”, and have to start again. Training deliverers should therefore plan adequately for consistent networks, and adequate bandwidth to ensure a smooth and reliable traffic flow. Software bugs are another set-back to delivering smooth training. The trainer should have access to Metalink, so that in the event that this should happen, they can download the relevant patches, and fix the bugs. The trainer can later come back and demonstrate that functionality to the students after the issue has been resolved and tested. It’s not good practice for the trainer to keep ignoring the functionality that doesn’t work as it should, without attempting to resolve the issue. The writer is a 23 year old Junior Functional Consultant with RPC Data Ltd. A premium Oracle partner based in Botswana, Zambia, South Africa and Uganda.